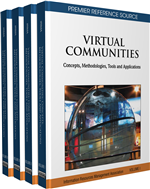 This chapter provides an overview and discussion of virtual communities in health and social care. The available literature indicates that a virtual community in health or social care can be defined as a group of people using telecommunications with the purposes of delivering health care and education, and/or providing support. Such communities cover a wide range of clinical specialties, technologies and stakeholders. Examples include peer-to-peer networks, virtual health care delivery and E-Science research teams. Virtual communities may empower patients and enhance coordination of care services; however, there is not sufficient systematic evidence of the effectiveness of virtual communities on clinical outcomes. When practitioners utilize virtual community tools to communicate with patients or colleagues they have to maximize sociability and usability of this mode of communication, while addressing concerns for privacy and the fear of de-humanizing practice, and the lack of clarity or relevance of current legislative frameworks. Furthermore, the authors discuss in this context ethical, legal considerations and the current status of research in this domain. Ethical challenges including the concepts of identity and deception, privacy and confidentiality and technical issues, such as sociability and usability are introduced and discussed.